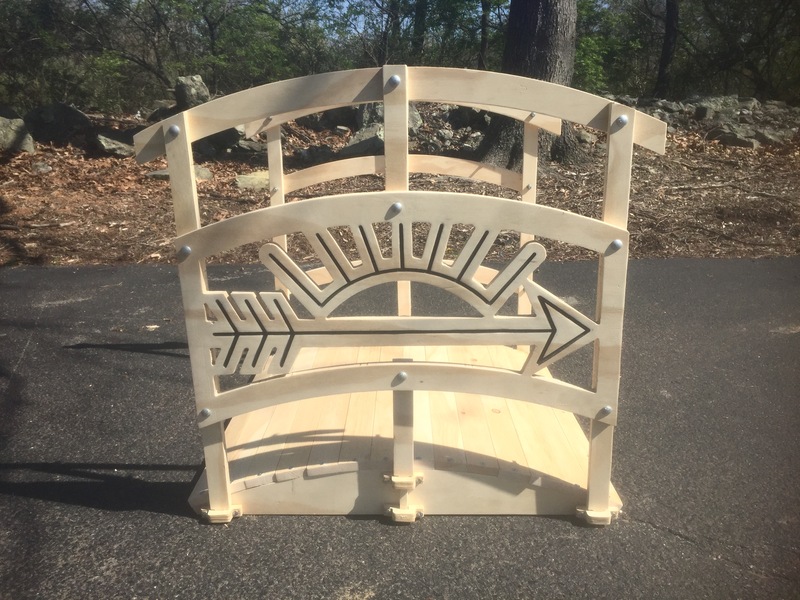 Collapsible bridge for use in Cub Scout bridging/graduation cermonies. ** The Arrow of Light symbol is engraved first followed by a tool change pause. If you would like to use a different bit to engrave the symbol, start off with the engraving bit, then switch to the straight bit for the rest of the cut. The picture below shows how the pieces are all put together. The railing pieces are fastened together with the carriage bolts. The bottom portion of the bridge is fastened together with the wood screws. The fit between the brackets (pictured in yellow) and the railings can be a bit tight. Sanding the bottom portion of the railings can help them to slot in and out more easily. Pre-drilling pilot holes for the wood screws is a must for this project because it requires screwing into the edge of the plywood.